There are countless products made for dogs to chew, all of these chews have some things in common. What would that be? Well, they are all slaughterhouse by-products and/or manufactured, and man-made. Yes, there are rope toys, pig’s ears, thigh bones, bully sticks, rubber thing-a-ma-jigs, rawhides, nylon treats and countless other man-made and or industrial by-product derived items, so the options are indeed endless, and somewhat overwhelming. But back to the original point, all these "chews" are derived from dead animals or are man-made with who knows what. Antlers on the other hand are a naturally and annually renewable resource, so nothing has to die and nothing has to be manufactured to create the best Dog chews in the world. The most important facts that make Antlers the better choice for chewing is that they are 100% organic, long lasting, and healthy. In my opinion, antler chews are by far the best choice for a Dog chew. If you are still not sure, please read from the list below, remember to compare and contrast Antlers to the traditional manufactured chews and treats we all have likely tried. Humane- Our antlers are naturally shed, they fall of as part of the normal life cycle. Sustainable- New antlers are naturally grown and shed each year. Nutritional- Naturally rich in iron, calcium, magnesium, potassium, zinc and phosphorus. Natural & Organic- There is only 1 ingredient, 100% Organic Antler. Convenient- Antler chews are clean, easy to store, not messy. Oral Health- Antler chewing helps keep teeth and breath clean. Economical- Purchase quality Antler from us and you will receive Value. Rocky Mountain Gobstoppers are ALWAYS cut from Fresh, Grade A+, Naturally Shed, 100% Organic, Antlers which are annually & ethically collected from wild and free-roaming Cervids located in Wyoming, Idaho, Utah and Montana. Not many antler purveyors know how new or old their antler dog chews really are and just because an antler is brown, does not mean it is fresh or should be compairable to a fresh brown naturally shed antler from the current shedding season. We are a small Family owned and operated Store that has a real passion and connection to our products! As the Owner/Operator I personally buy all of the antlers from the folks who hike out each spring to hunt these natural treasures. I personally do all the cutting and fulfillment as well. I cut my antlers on an as needed basis, therefore your chews are going to be as fresh as possible. I am with the antlers from start to finish, and I feel I can offer you the customer the absolute best Antler chews in the World. So we are serious when we claim to have the Worlds Finest Antler Chews! At ElkAntlerDogChews.Com, we strive to not only offer the highest quality Antler Dog Chews available anywhere but also at the lowest price! Rocky Mountain Gobstoppers, ya' the name is a mouthful...I will be the first to admit it, but the idea behind it is a brand name that you won't easily forget. Now that we have our own legally Trademarked brand name through the USPTO, (U.S. patent office) we can start to fulfill our dream of making our name known for the best antler dog chews in the entire world! I know that's a tall task, but I am up to the challange and with help from you, our satisfied customers we we can do it. Product Reviews ....We are grateful for those who have taken the time to post pictures and reviews on our products now that we are able to showcase them. Reviews are a huge part of any online store and we unfortunately did not start out with the ability to process reviews. For nearly a decade we were missing out on that important data. That has finally been fixed, so please let us know how you like our Antler Chews by posting your Pup pictures and written reviews within the link located on the items page of each specific antler chew we offer. Why Elk Antler Dog Chews? Elk Antlers actually have the largest marrow core in the antler world. It is the bio-available vitimin and minerial rich marrow center that keeps dogs occupied for hours a day! Elk antlers are an all-natural, 100 % organic and annually renewable resource, unlike Bully-Sticks, Bones, Ears, Raw-hides, etc. that all must come from dead animals! Male Elk shed their antlers each spring as part of a natural process. Thus no animals are harmed to collect our Elk Antlers! Elk Antlers contain no artificial color or added hormones, antibiotics, animal by-products, steroids or preservatives! Elk Antlers are good for the Dog's body, as they contain many beneficial bio-nutrients and minerals and the chewing action promote fresh breath as well as clean white teeth! Antlers are virtually odor & residue free, no mess! Unlike bones, fresh Elk Antler Dog Chews are virtually impossible to chip or splinter when they are being chewed! They last longer than you can imagine! Our Long-Lasting Rocky Mountain Gobstoppers Antler Chews will provide you and your Dog with priceless quality time and enjoyment. Elk, Deer, Moose, and other antlered mammals shed their antlers annually. This process is due to hormone fluctuations which stimulate the shedding of antlers and the re-growth of new ones. 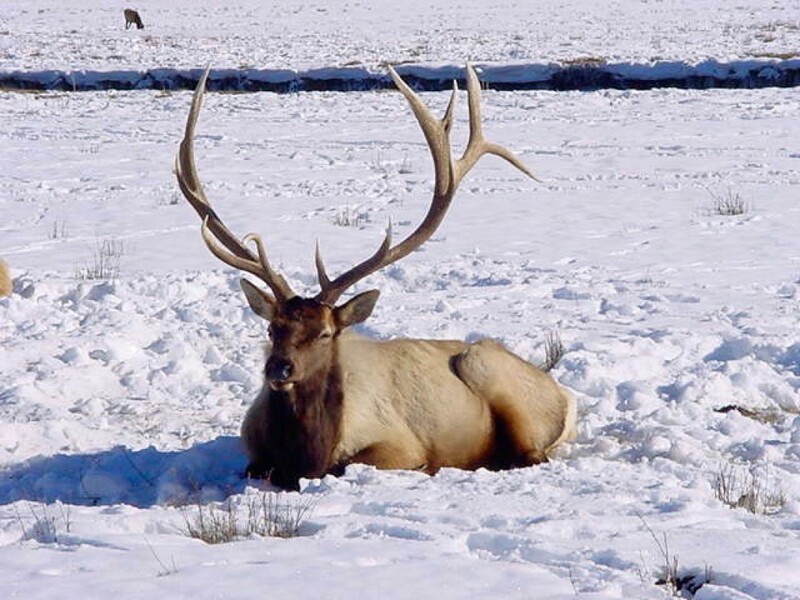 Elk typically shed their antlers in late March and throughout April. Elk begin the process of re-growing a very similar shaped rack immediately after shedding. During this amazing growing process, an elk’s antler can grow up to 2” per day. The new living antler is covered in a fuzzy skin called velvet, until the antler quits growing and hardens at summers' end then blood supplies are cut off and the velvet dies. Bulls then rub the shedding velvet on trees and shrubs to help slough it off revealing new white antler. Throughout the fall season Elk rub their racks on trees and shrubs, which gives the antler their beautiful natural color. Where no trees are available, the antler can remain light in color. The size and shape of an antler is dependent the quality and availability of food, the particular animals health, genetics and maturity. In contrast to Antler, the horn grown by a Buffalo or Bighorn sheep does not fall off. 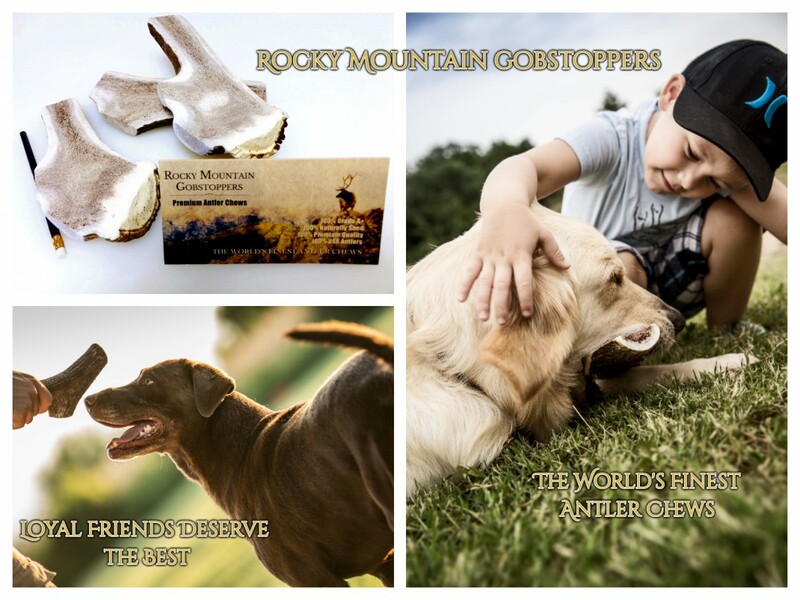 Rocky Mountain Gobstoppers - The Worlds Finest Antler Chews!